This lithograph is taken from plate 9 of "General Views of Lucknow" by Sir DS Dodgson. The Dilkusha in Lucknow was built as a hunting lodge in the centre of a park stocked with game. Constructed in European style with corner towers by Saadat Ali Khan (1798-1814), it is now a ruin set among flower gardens. During the Indian uprising of 1857 it was a rebel stronghold. 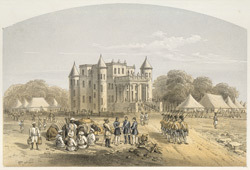 Several routes were discussed by the British as an approach the to the Residency during the relief of Lucknow. Ultimately, Sir Colin Campbell chose a direct route, and with his second relief force advanced from the fortress of Alam Bagh via the thickly wooded Dilkusha. The Indian rebels had not expected him to pick this route and were taken by surprise. They put up a stiff resistance, however, and after fierce fighting Campbell's forces finally the Residency in November 1857. The survivors were evacuated to Dilkusha, where General Havelock died of overwork and dysentery.